Before you can successfully complete this courseware, you need to complete three subcategories including Waiter Servicing, Room Attendant Servicing, and Bus Boy Servicing. Waiter Servicing allows its learners to know the duties and responsibilities of a waiter or attendant. It has seven modules including the introduction to this courseware, introducing the types of Food Service, ways on how to prepare the dining area for the service, welcoming guests, presenting a menu, taking orders, serving food/beverage, presenting bills and bidding goodbyes. Room Attendant Servicing introduces 5 modules which mainly focuses on the task and services rendered by a room attendant. They teach its learners the main roles of room attendants, take orders by telephone, room clean up, assemble and delivery of guest orders. Bus Boy Servicing introduces you to the world of Food and Beverage Service. It also allows you to know the right way of bussing out dirty dishes and the 5S of Good Housekeeping, which is truly necessary to become a competitive Housekeeper. Note: Tesda Online Program does not issue any training certificate of completion. If you are aiming to have a National Certificate (NC) in Food and Beverage Servicing, you may go to the nearest Assesment Center and take the national Assessment. 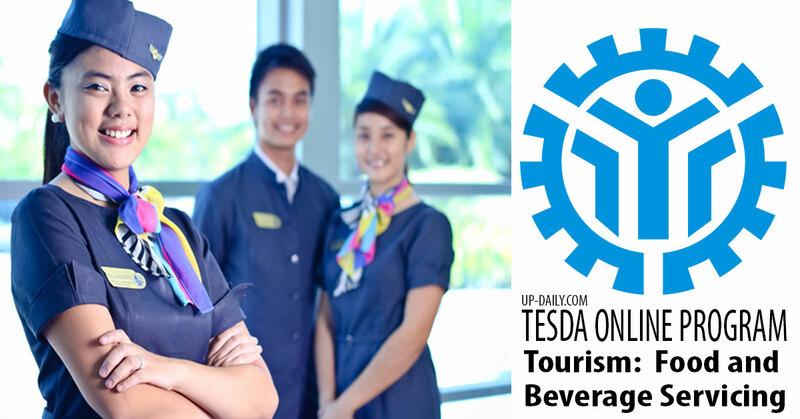 By the end of Tourism/Food and Beverage Servicing, you will certainly know the basics of the Food and Beverage Service Organizational Chart. You will also know the duties and responsibility of a good Food and Beverage Service Personnel and the specific job and responsibilities of a waiter. This course does not have a course prerequisite.